*Q: Where can I view Stone Willow Jewellery? *Q: Do you give back to your community? A: I am a big supporter of organizations that support children, the environment and animals, as well as local community charities. Stone Willow donated 2%-9.6% of proceeds to charitable organizations every year from 2009 – present). See my “giving back” section to read in more detail about who I helped out in past years. * Q: Do you have Gift Certificates? A: Yes, Gift Certificates are available – please send me your request to nicole@stonewillow.ca or click here for direct link. Gift certificates are available for online purchases and can be sent in the mail or via email to the requested recipient. To redeem a gift certificate, purchase online through my Etsy shop, select the item you wish to purchase, click the green checkout button then select “other” payment option. Enter your gift certificate number in the message box. If money is outstanding, a paypal invoice will be sent and must be paid before the product is shipped. If your gift certificate covers the cost of the product and shipping charges, you are good to go. A confirmation email will be sent out. *Q: What are your payment options? 1.Direct Checkout – credit cards (Visa, MC, American Express, Discover), debit payment, Etsy gift cards, Apple Pay & Google Wallet (US purchasers only), Euro specific payment methods. 2. Paypal – use your paypal account or use paypal as a guest (no membership needed). I can also send you a paypal invoice. 4. If you wish to pay in cash and pick up your purchase in person, please e-mail or call me first to make arrangements. * Q: Can I have a different clasp or change one aspect of the jewellery design with something I have seen on another one of your pieces? A: Anything is possible. Some components are more costly than others. Send me your specific request and I will quote you a price. *Q: Can earrings be made with a different earring component? A: Earrings can be designed with an ear wire, stud and sterling butterfly clutch or lever back. All components are a high quality .925 sterling silver. Please request if you would like rubber backings for your ear wires. * Q: How do I determine the correct size of bracelet for me? A: Some people like a bracelet fairly snug to their wrist and others like it to hang over the widest part of their hand. The best way to determine the right size for you is to measure the length of a bracelet you already have that fits you the way you like. For an estimate, you can measure your wrist and add approx 1.25″ to your wrist measurement. Multi-strand bracelets & leather bracelets should fit more snugly around the wrist. I have made bracelets that range from 6″ – 9.5″. An average size for a woman would measure 7.5″ – 7.75″. If you don’t have a flexible measuring tape, take a piece of string and wrap it around your wrist. Then measure this string to determine the length. *Q: Can I have my jewellery resized? A: Resizing will be free one time, although shipping charges are the responsibility of the customer. If you need your jewellery resized more than once, charges will be $10 and shipping will be the responsibility of the customer. Some items such as leather bracelets are permanent in size once made. Please inquire if you need a size adjustment. *Q: How do I care for my sterling silver jewellery? A: Sterling Silver can tarnish when oxygen and moisture react with the metal. To prevent tarnishing and to keep your sterling shiny and new looking, keep your jewellery in an airtight container or bag with an agent that removes the moisture such as a piece of carbon paper, a capsule filled with carbon (found in some vitamin containers to retain freshness), or a fresh pack found in dry foods. For minor tarnish on sterling, wiping the metal down with a jewellers polishing cloth, will retain the original shine. For tougher to remove tarnish, a gentle sterling silver cleaner will work. Avoid using toothpaste as this will scratch your silver. 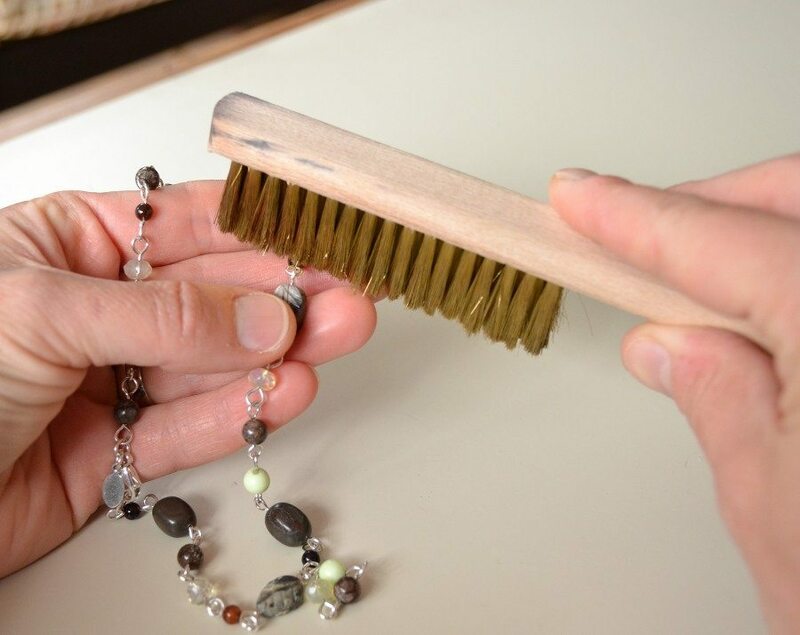 For a chemical free alternative – my favourite way of cleaning – buy a fine brass bristle brush at your local lapidary store and brush your jewellery with some liquid dish soap and water. Let the jewellery dry thoroughly before storing. *Q: What about returns or repairs? A: Please read the information section for “RETURNS” and “GUARANTEE” located in the top menu bar. *Q: What is the difference between a fresh water pearl and a Swarovski Crystal pearl? A: A freshwater pearl is created when a fresh water mussel has a piece of foreign material inserted into it’s flesh. The mussel reacts by covering this foreign material with nacre to create its lustrous quality just as an oyster would do in salt water. Swarovski Crystal pearls are created by covering a crystal core with a pearl coating to imitate a naturally made pearl. These pearls are very durable and are resistant to scratches, perspiration and perfumes. *Q: What is lampworked glass? A: Lampbeads, as they are also called, are handcrafted borosilicate glass that is worked over a hot flame. These interesting beads are very durable and add interest to any jewellery piece. *Q: Is Stone Willow environmentally responsible? A: Everything that can be recycled is, even down to the smallest piece of plastic. All packaging that can be reused instead of being recycled, is re-purposed. To protect our ecosystem, I will not purchase items that will damage the environment such as corals, which are living organisms. Harvesting corals causes damage to our ecosystem. I purchase eco-friendly recycled paper jewellery boxes and hand stamp them myself.